Short description: Lielais Liepu Hill (The Great Lime Tree Hill-ENG.) 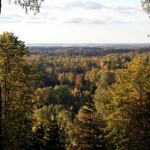 The hill (289, 3 m above the sea level) is the highest peak in Latgale and the third highest peak in Latvia. On the peak of the hill there is the highest sightseing tower in Latvia (34 m) built of wood. One can enjoy a wonderful view to Lake Rāzna and its surroundings. Short description: Lake Lubāns, wetland of Lubāns. 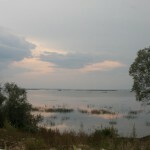 Lubāns (80,7 km2) is the largest lake in Latvia and the unique wetland in Europe. The lake and the wetland have high biodiversity. Nature Reserve is included in the European Union network of protected areas and NATURA 2000 under the Ramsar Convention criteria as the wetland of international importance. Lubāns wetland, called marshy meadows, includes bogs, wet meadows and wet forests. In autumn and spring the lake attracts thousands of migratory waterfowl which is easily to wach from the bird observation towers or the terrace of water tourism development center. Short description: Ļoļi Velna pēdas stone is located in a small wooded meadow at the border of Rēzekne and Krāslava municipalities. It is 1,9m high rounded cone with the base perimeter 1,8m. This stone is a geological monument and was registered in the 1930s, and belonged to another administrative territory. 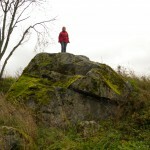 Short description: It is one of the largest boulders in Rēzekne region and is located on hillock called by local people Magoņkalns just 40m to the left of the road Jaunviļāni – Medinsku. The boulder is 6,6m long, 5,4m wide, 3,3m high. 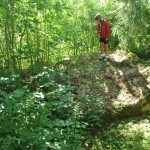 Short description: In Mākoņkalns parish, not far from stone Āžmugura one can see a wide stone- Platais akmens. 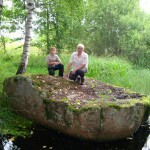 Short description: The Boulder of Purmaļi is the biggest boulder in Rēzekne district and one of the 20 biggest boulders in Latvia. It is located on the escarpment surrounded by the trees and the bushes. Perimeter 18,5 m, height 3,2 m, lenght 5,6 m, width 4,7, surface volume 30 m3. It has been protected by the state since 977. 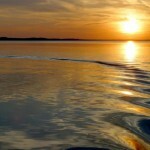 Short description: Lake Rāzna (57,8 m2) is often called the sea of Latgale. It is the biggest lake in Latvia. Rāzna is situated on the hill Rāznava with beautiful landscapes, high peaks and Latgalian castle hills. Enjoy the recreation places beside the lake, the National park of Rāzna and its surroundings. The place is included in the European Union network of protected areas NATURA 2000. The lake has 10 islands with the territory 24,6 ha. The largest islands are Apaļa sala and Apšu sala. Two gulfs- Zosnasgals and Dūkstigals. The level of the water is 163,8 m above the see level. In 2006 Rāzna National Park was opened. Short description: Subinaites boulder is located in Sakstagals parish. The stone base is below the river level 2,5m, which is 5,2m long and 4,4m wide, above the water level rises about 1,6m. It has been protected since 1977. Short description: Stork watching by optical devices. 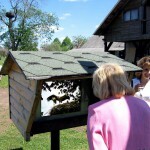 One has the opportunity to observe the storks’ life with optical devices. A horse yard "Untumi", 4 km from Rēzekne city. 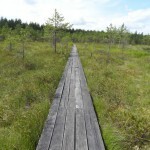 Short description: Teirumnieki marsh pathway is included in Lubāna wetland. Enjoy habitats and landscapes of the bog by walking along 800 m long footbridge path which leads along Lake Teirumnieki and recreation place.